(1) Echocardiography should be performed in patients for the diagnosis of MS, assessment of hemodynamic severity (mean gradient, MV area, and pulmonary artery pressure), assessment of concomitant valvular lesions, and assessment of valve morphology (to determine suitability for percutaneous mitral balloon valvotomy). (2) Echocardiography should be performed for reevaluation in patients with known MS and changing symptoms or signs. 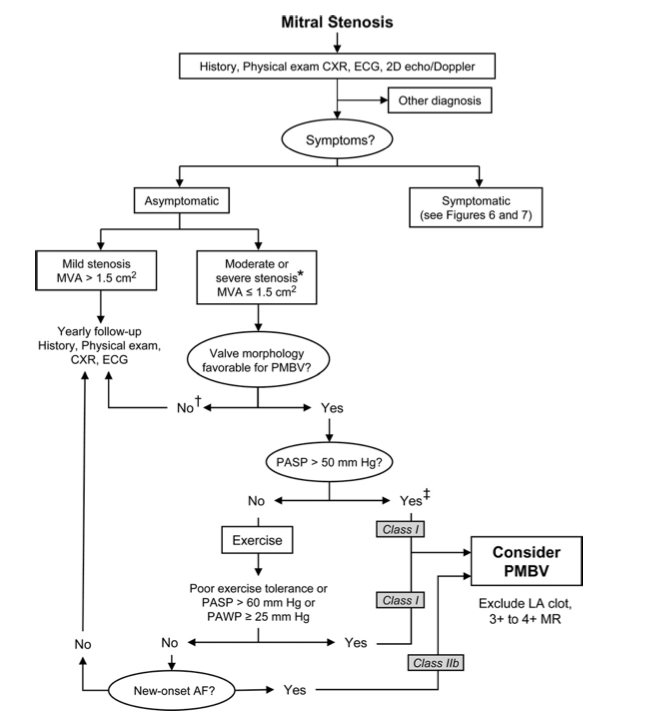 (3) Echocardiography should be performed for assessment of the hemodynamic response of the mean gradient and pulmonary artery pressure by exercise Doppler echocardiography in patients with MS when there is a discrepancy between resting Doppler echocardiographic findings, clinical findings, symptoms, and signs. (4) Transesophageal echocardiography in MS should be performed to assess the presence or absence of left atrial thrombus and to further evaluate the severity of MR in patients considered for percutaneous mitral balloon valvotomy. (5) Transesophageal echocardiography in MS should be performed to evaluate MV morphology and hemodynamics in patients when transthoracic echocardiography provides suboptimal data. (1) Echocardiography is reasonable in the re-evaluation of asymptomatic patients with MS and stable clinical findings to assess pulmonary artery pressure (for those with severe MS, every year; moderate MS, every 1 to 2 years; and mild MS, every 3 to 5 years). (1) Transesophageal echocardiography in the patient with MS is not indicated for routine evaluation of MV morphology and hemodynamics when complete transthoracic echocardiographic data are satisfactory. (1) Anticoagulation is indicated in patients with MS and atrial fibrillation (paroxysmal, persistent, or permanent). (2) Anticoagulation is indicated in patients with MS and a prior embolic event, even in sinus rhythm. (3) Anticoagulation is indicated in patients with MS with left atrial thrombus. (1) Anticoagulation may be considered for asymptomatic patients with severe MS and left atrial dimension greater than or equal to 55 mm by echocardiography. (2) Anticoagulation may be considered for patients with severe MS, an enlarged left atrium, and spontaneous contrast on echocardiography. (1) Cardiac catheterization for hemodynamic evaluation should be performed for assessment of severity of MS when noninvasive tests are inconclusive or when there is discrepancy between noninvasive tests and clinical findings regarding severity of MS.
(2) Catheterization for hemodynamic evaluation including left ventriculography (to evaluate severity of MR) for patients with MS is indicated when there is a discrepancy between the Doppler-derived mean gradient and valve area. (1) Cardiac catheterization is reasonable to assess the hemodynamic response of pulmonary artery and left atrial pressures to exercise when clinical symptoms and resting hemodynamics are discordant. (2) Cardiac catheterization is reasonable in patients with MS to assess the cause of severe pulmonary arterial hypertension when out of proportion to severity of MS as determined by noninvasive testing. (1) Diagnostic cardiac catheterization is not recommended to assess the MV hemodynamics when 2D and Doppler echocardiographic data are concordant with clinical findings. (1) Percutaneous mitral balloon valvotomy is effective for symptomatic patients (NYHA functional class II, III, or IV), with moderate or severe MS* and valve morphology favorable for percutaneous mitral balloon valvotomy in the absence of left atrial thrombus or moderate to severe MR.
(2) Percutaneous mitral balloon valvotomy is effective for asymptomatic patients with moderate or severe MS* and valve morphology that is favorable for percutaneous mitral balloon valvotomy who have pulmonary hypertension (pulmonary artery systolic pressure greater than 50 mm Hg at rest or greater than 60 mm Hg with exercise) in the absence of left atrial thrombus or moderate to severe MR.
1. 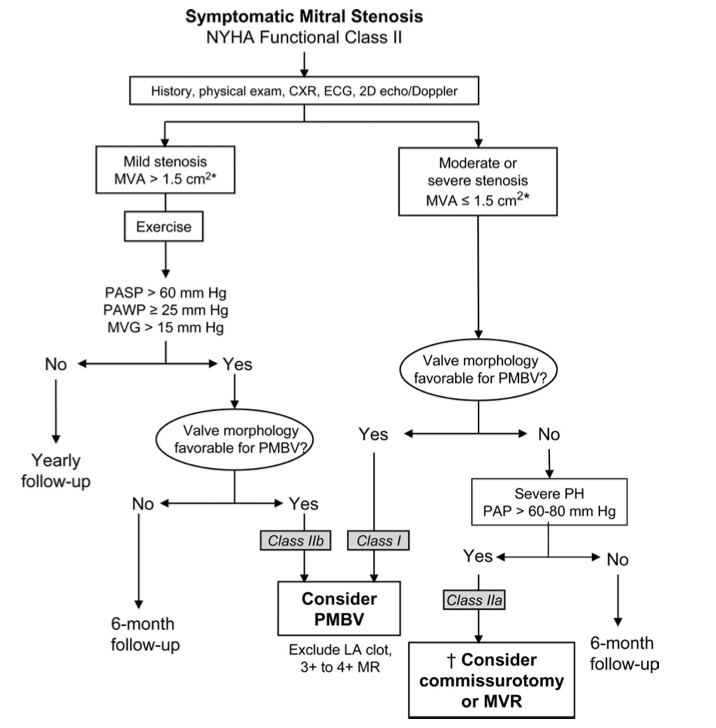 Percutaneous mitral balloon valvotomy is reasonable for patients with moderate or severe MS* who have a non-pliable calcified valve, are in NYHA functional class III–IV, and are either not candidates for surgery or are at high risk for surgery. 1. Percutaneous mitral balloon valvotomy may be considered for asymptomatic patients with moderate or severe MS* and valve morphology favorable for percutaneous mitral balloon valvotomy who have new onset of atrial fibrillation in the absence of left atrial thrombus or moderate to severe MR.
2. Percutaneous mitral balloon valvotomy may be considered for symptomatic patients (NYHA functional class II, III, or IV) with MV area greater than 1.5 cm2 if there is evidence of hemodynamically significant MS based on pulmonary artery systolic pressure greater than 60 mm Hg, pulmonary artery wedge pressure of 25 mm Hg or more, or mean MV gradient greater than 15 mm Hg during exercise. 3. Percutaneous mitral balloon valvotomy may be considered as an alternative to surgery for patients with moderate or severe MS who have a nonpliable calcified valve and are in NYHA functional class III–IV. 1. Percutaneous mitral balloon valvotomy is not indicated for patients with mild MS.
2. Percutaneous mitral balloon valvotomy should not be performed in patients with moderate to severe MR or left atrial thrombus. (1) MV surgery (repair if possible) is indicated in patients with symptomatic (NYHA functional class III–IV) moderate or severe MS* when 1) percutaneous mitral balloon valvotomy is unavailable, 2) percutaneous mitral balloon valvotomy is contraindicated because of left atrial thrombus despite anticoagulation or because concomitant moderate to severe MR is present, or 3) the valve morphology is not favorable for percutaneous mitral balloon valvotomy in a patient with acceptable operative risk. (2) Symptomatic patients with moderate to severe MS* who also have moderate to severe MR should receive MV replacement, unless valve repair is possible at the time of surgery. 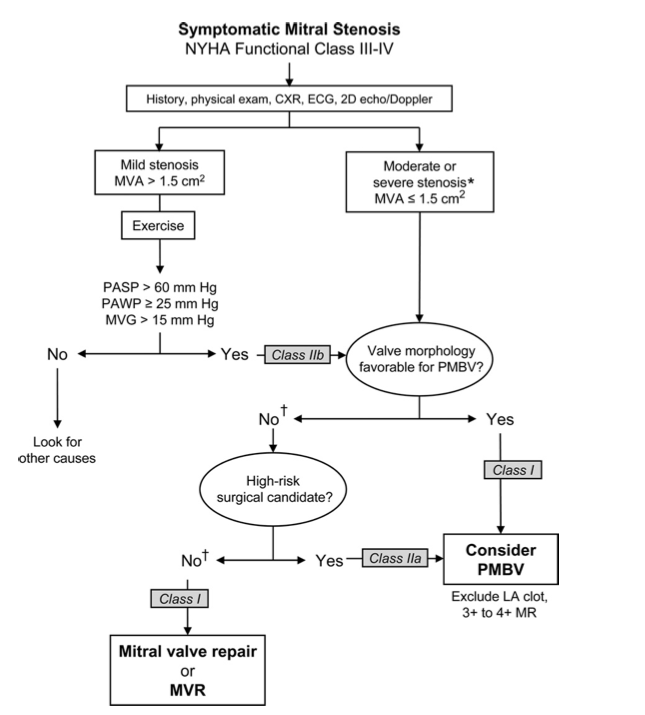 (1) MV replacement is reasonable for patients with severe MS* and severe pulmonary hypertension (pulmonary artery systolic pressure greater than 60 mm Hg) with NYHA functional class I–II symptoms who are not considered candidates for percutaneous mitral balloon valvotomy or surgical MV repair. (1) MV repair may be considered for asymptomatic patients with mod- erate or severe MS* who have had recurrent embolic events while receiving adequate anticoagulation and who have valve morphology favorable for repair. (1) MV repair for MS is not indicated for patients with mild MS.
(2) Closed commissurotomy should not be performed in patients undergoing MV repair; open commissurotomy is the preferred approach.